Readings are typically about love. The wedding ceremony features readings that a couple selects to illustrate something special about their relationship. Choosing the right readings and when to insert them in the wedding ceremony are important decisions. A few guidelines can make this process easier. When Do Ceremony Readings Take Place? Although the order of a wedding ceremony depends on its type and the individual preferences of the bride and groom, the readings typically take place in the early or middle portion of the ceremony. Some couples choose only one selection, while other couples may opt for a second reading after a solo or other musical interlude. The readings typically take place sometime following the opening comments by the officiant and once the bride and wedding party have made their entrances. The vows and the exchange of rings take place sometime following the ceremony readings. There are a several types of ceremony readings a bride and groom can typically choose from, although couples can work with the officiant or wedding coordinator to choose whatever selections they wish to have for the ceremony. The readings typically are based on love and are incorporated to celebrate and honor the commitment the couple is about to make. For religious ceremonies, the most common readings are those from the sacred book or books pertaining to that religion. 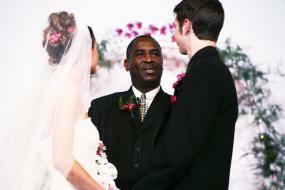 Some religions may have certain readings, chants, or prayers that are to be specifically used for weddings. The clergy person officiating for the wedding may have a pre-listed selection of Bible passages or sacred verses commonly used for weddings the couple can choose from, or they can request passages they wish to have read. The verses may focus on God's love, marital love, or a selection on each. A common reading from the Talmud for a Jewish wedding ceremony is Ketubot 8 on love and celebrating marriage. The seven blessings as read from Anita Diamont's The New Jewish Wedding is another popular choice for Jewish couples. Couples getting married in a Muslim wedding ceremony will typically listen to readings from the Quran on marriage. 1 Corinthians 13: 12-17: This passage discusses the attributes of love, such as goodness, patience, and kindness. It is also a favorite for weddings because of its mandates in verse 8, that "love never fails," and verse 13, "And now these three remain: faith, hope and love. But the greatest of these is love." Ephesians 5: 21-33: This passage discusses the role of love and respect in the marital relationship. Colossians 3:12-17: This selection highlights the importance of love and forgiveness, pronouncing in verse 14 that love binds all other virtues "together in perfect unity." I John 4:7-19: These verses discuss the nature of God's love and the nature of perfect love. Ecclesiastes 4:9-12: Discusses relationships and the strength of them when God is the third addition. Poetry can be a perfect sentimental reading. Shorter love or marriage poems or stanzas of poetry from a longer poem based on love are another form of text used for nuptial readings. These are often from classic authors, such as Shakespeare, although some couples are choosing from more contemporary wedding, love, or marriage poems. Some couples may even write their own poetry for their wedding. Some couples may choose untitled poems that reflect their heritage or have been handed down through familial generations, such as a special Hindu poem for an Indian wedding ceremony or an anonymous Native American poem or chant for a Native American Ceremony. Whether from a classic love song or one of the latest hits, song lyrics are often expressive choices for representing the love a couple has. To search for lyrics to particular songs, visit a lyrics database such as Lyrics.mode.com. Each couple writes a ten item list of what they love about the other person. Together, the couple writes a definition of what love means to them. Individually or together, couples can briefly describe other couples whose relationships have impacted their view of love. Whatever wedding ceremony readings a couple chooses for their big day, the words should be reflective of the couple's love and commitment and celebrate the marriage in a way that is meaningful to them. .